PEORIA, Ill. (CNS) — The Diocese of Peoria has reacted with “great joy” to a decision by a New York court in favor of Joan Sheen Cunningham’s petition to have the remains of her uncle, Archbishop Fulton J. Sheen, moved from New York City to Peoria. “It is the hope that this process will begin immediately,” said a diocesan news release, issued June 8 following the ruling by Manhattan Supreme Court Justice Arlene Bluth that again clears the way for the remains of the famed orator and media pioneer to be removed from St. Patrick’s Cathedral in New York and transferred to St. Mary’s Cathedral in Peoria, the archbishop’s home diocese. Peoria Bishop Daniel R. Jenky said he hoped the Archdiocese of New York — which appealed Bluth’s original ruling in favor of Cunningham in late 2016 — will now “cease its legal resistance.” He asked all to pray “for a renewed spirit of cooperation” to move Archbishop Sheen’s sainthood cause forward. But in 2016, Cunningham, who is Archbishop Sheen’s oldest living relative, filed a petition with the courts in New York asking that his body be moved to the Peoria cathedral. She said her uncle would not have objected to his remains being transferred to his home diocese from the crypt at St. Patrick’s Cathedral where he was entombed following his death in 1979 at age 84. 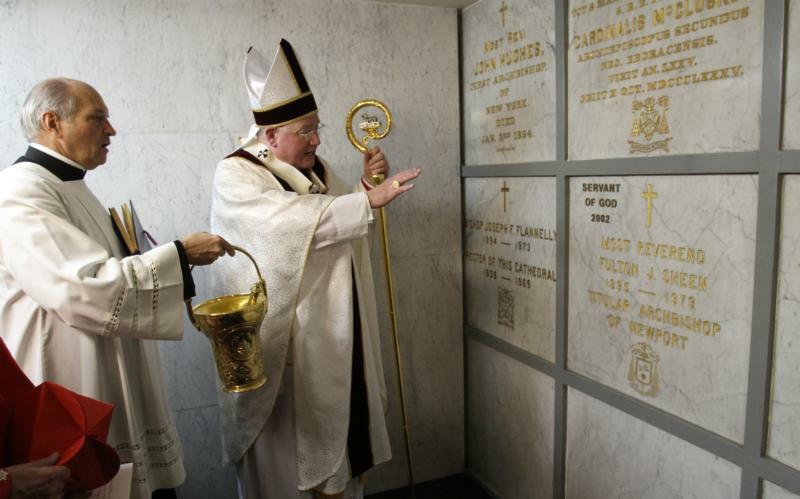 Returning the prelate’s remains to Peoria “will be the next step toward bringing ‘Venerable’ Archbishop Sheen’s beatification to completion including a beatification ceremony in Peoria, Illinois,” said the diocese’s news release. “The process of beatification and canonization focuses only on where the soul of a person is, not on where an individual’s mortal remains might be,” it said. The Vatican Congregation for Saints’ Causes has said “the cause can progress without any transfer of the remains,” according to the statement. Born May 8, 1895, in El Paso, Illinois, Fulton John Sheen was ordained a priest of the Diocese of Peoria at St. Mary’s Cathedral in 1919. A crypt has been prepared there for his reinterment.